Reading Reformed works on Scripture (here I would group Calvin's Institutes, William Whitaker's Disputations on the Holy Scriptures, as well as Turretin) can be very illuminating, and presents a rather different perspective on Scripture than many modern writers (1). While this article is providing a brief introduction to Turretin, what I'm saying below could just as well be said of the others mentioned above. One theme is the presuppositional approach to the Bible, which was used in addition to the more evidentialist approaches more popular now. Presuppositionalism, as a methodology, is not merely something that the Reformers utilized. It was foundational to Reformation theology (2). Look at Turretin's thoughts on the Bible's inspiration, for example. In question He doesn't attempt to prove its inspiration, or even, simply to demonstrate that such a view is reasonable (in contrast to modern evangelicals, who will argue that it is reasonable to believe that Jesus rose from the dead, and that prophetic writings were indeed written before the events predicted, and so, based on these premises, that the inspiration of the Bible is a valid conclusion). Instead, Turretin (in Question 6, Section 8) places the Bible's inspiration in the Aristotelian category of First Principles (which have to be assumed, and cannot be proven or disproven). He also writes of the witness of the Holy Spirit, in the minds and hearts of the regenerate, to Scripture's inspiration(3). Both of these approaches are presuppositional, as opposed to evidential. In short, they are part of a paradigm or world-view, as opposed to propositions that can be proved or disproved to skeptics. A second approach taken by Turretin might be surprising to those who have not studied Reformation bibliology-its "tiered" understanding of authoritative Scripture. In contrast to the Roman theologians of their day (and the KJV advocates of today), Turretin held that the original Hebrew and Greek readings had not been lost, but were located in the majority of the manuscripts that were available. He did not argue that any or every copy was perfect, but only that such errors could be easily straightened out by a diligent sifting through the various manuscripts. Turretin was very clear that if the original readings had in fact been lost in the course of history, there would be no way of knowing which readings were in fact original, and no way of knowing whether in fact the Latin Vulgate was or was not, a pure copy of the original texts. He didn't simply uphold the value of Bibles translated into the common tongue, over against the Vulgate. He also argued that the Vulgate itself was a corruption of the original text, which could be known and determined by comparing the Hebrew and Greek readings with the Vulgate. This primacy of the original languages was necessary for any certainty about the accuracy of translated Bibles. And so Reformed bibliology recognized a tiered system of authority. On the upper level are the manuscript copies of Hebrew and Greek, which could be used to create or correct vernacular translations. Secondary to this were the vernacular translations themselves, which were to be read and studied by the faithful as God's inspired word, but which could not be used to correct the original tongues, and might even have errors in them (the translations). not die out or be lost in history. No attempt is made to prove this evidentially; this concept of the preservation of Scripture is deduced from the Bible's inspiration. Of course it is true that the Reformers believed that the true, original Greek and Hebrew readings had been preserved in the majority of the manuscripts; yet this was a belief that did not arise from a comparison among the majority of the manuscripts, or a consultation of very early manuscripts. Their approach stands in sharp contrast to modern textual criticism, which holds that while most of the true original readings have survived in the majority of the Greek manuscripts, that a large percentage died out and were overtaken by (mainly) additions from scribes over the centuries. Now I am not about to suggest that in order to be truly "Reformed," or even "orthodox," one cannot subscribe to modern-day textual criticism. Nor do I suggest that the Reformers were infallible (in their textual theories or otherwise). As a credo-baptist I couldn't hold that position for long. But their arguments here do deserve a hearing. It is unfortunate that modern theories of textual criticism are the only ones heard by so many people. 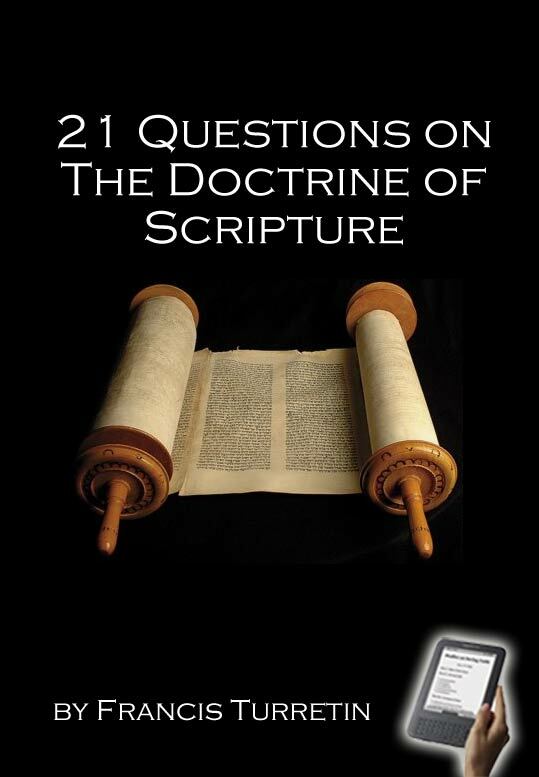 As a matter of fact, Turretin in Question 12, identified two methodologies in textual criticism. One, used for the critical text, was to use human reason in comparing different manuscripts or versions, even to the point of making conjectural emendations. The second was to accept as divinely inspired, the words of the Greek and Hebrew texts, which does not place human reason on a level of authority with God. As he continued to argue, if indeed we are able to correct the Hebrew MSS, then there is no way that it can be authoritative, because any word we don't like can be eliminated. None of the above is to suggest that the only thoughts we need to think about the Bible, were written down by the Reformers. For example, the works done from a more evidentialist perspective (justifying Christian claims of the Bible's inspiration and reliability) in recent years has provided solid answers to people (Christians and non-Christians alike) asking legitimate and fair questions about the Bible. But without paying attention to the answers to these questions that Turretin and his ilk gave, we run the risk of re-inventing the wheel (at best), by refusing to learn from the warriors of the faith who stood before us. 1. These same ideas can be seen also in Chapter 1, Section 8 of the Westminster Confession of Faith. 2. This is not the place to discuss the advantages of either presuppositional or evidential approaches to defending and articulating the faith (and each side does have its advantages). I only wish to highlight here differences between the more presuppositional approach of the Reformers, and the more modern evidentialist approach. 3. His arguments here are rather similar to Calvin's, in his Institutes, Book 1, Chapter 7.